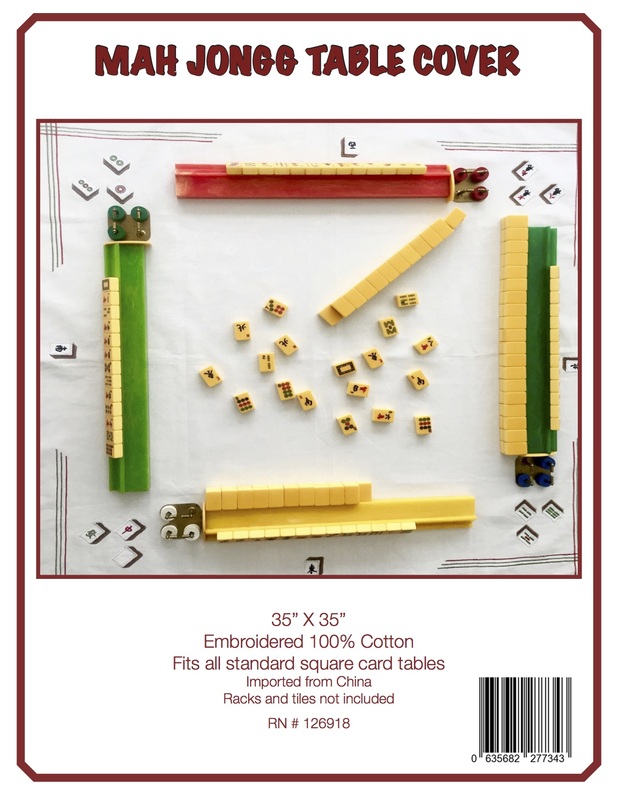 WE LOVE SIAMESE MAH JONGG…AND GLADYS GRAD! 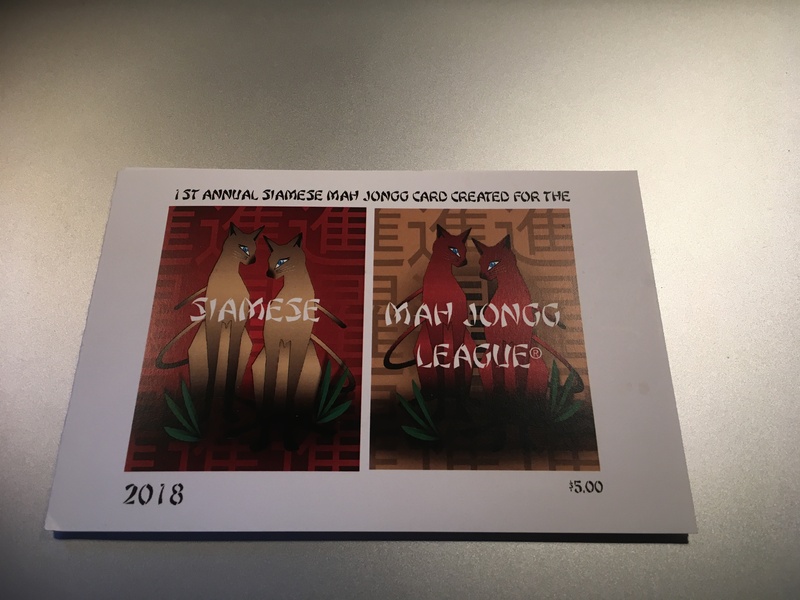 So, leave it to Gladys to create this card and make it available at a very inexpensive price to add to our Mah Jongg pleasure. The card is the same format that we are used to with rules and how-to play on the back of the triptych card. Once again, Gladys rules! Order some cards for your group and get into the newest form of Mah Jongg that we are all playing and loving! This entry was posted in Mah Jongg and Me and tagged Gladys Grad, mah jongg, mahjong, nmjl, Royale, Siamese on June 9, 2018 by Mah Jongg and Me. MAH JONGG FUN IN THE SUN! Eventually the sun is going to come out this summer and the temperature will rise. 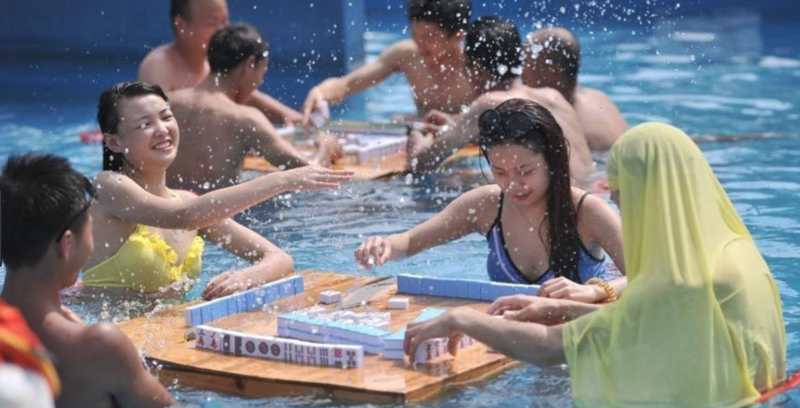 When this happens, how about some Mah Jongg in the coolest possible place during the hot summer months? 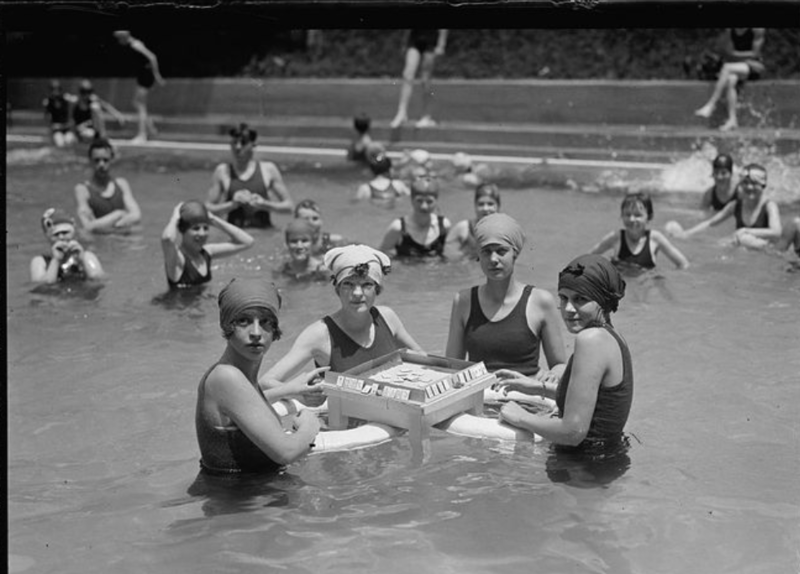 It would seem that people have been beating the heat while playing their favorite game in the water for quite a while. Here are some photos of Mah Jongg players trying to keep their cool – physically and mentally! 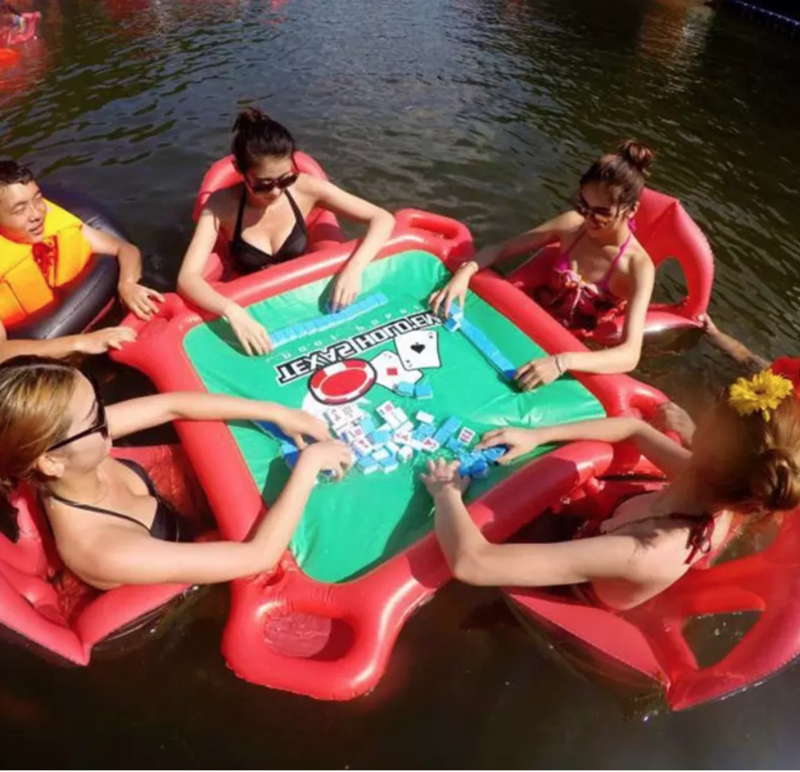 And just in case you would like to enjoy your summer games in this very same way, there is a company in China by the name of DHgate that will ship a floating Mah Jongg table with chairs to you for $132.84 with free shipping – and I think that is a pretty fair price to be able to play our favorite game in the cool of a pool or lake! If any of you have one of these floating tables, take some photos and send them to me so I can show it to everyone in a future posting. 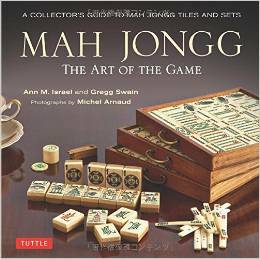 This entry was posted in Mah Jongg and Me and tagged DHgate, floating Mah Jongg table, mah jongg, mahjong on June 7, 2018 by Mah Jongg and Me. 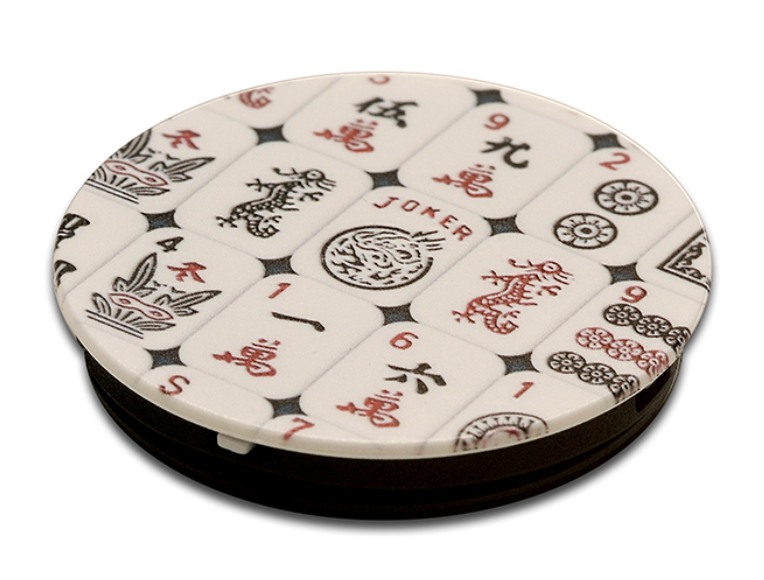 I am so excited about my newest toy – a phone popup stand with a Mah Jongg design. 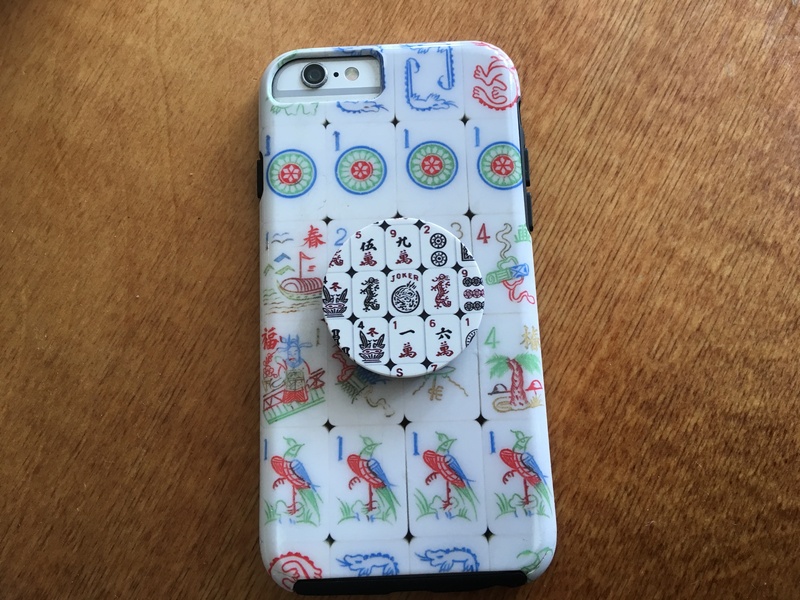 I have seen so many people with these stands on the back of their phones but didn’t want to put something plain on my Mah Jongg iPhone case. 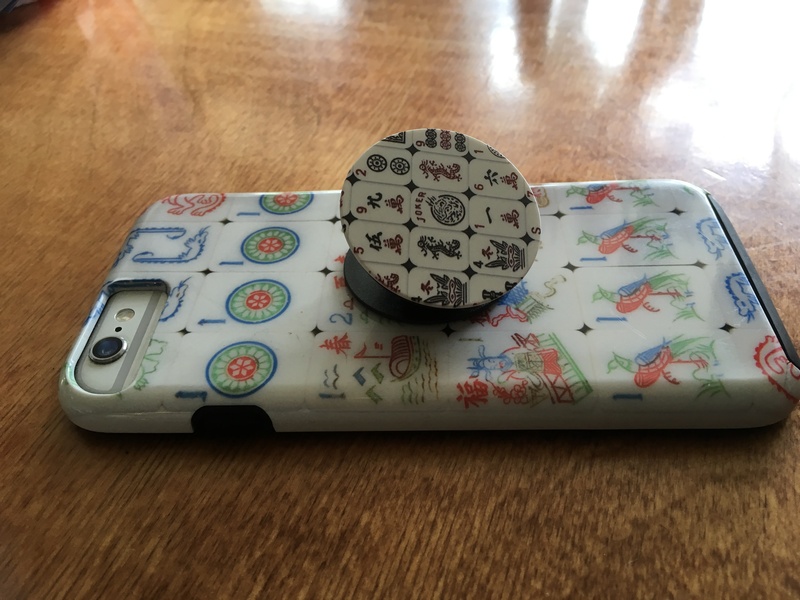 Last week I was browsing gifts at my favorite Mah Jongg online store, Where the Winds Blow, and sure enough, there was a Mah Jongg popup phone stand, which I immediately ordered. And yesterday it arrived and immediately was attached to my iPhone…LOVE IT!!! 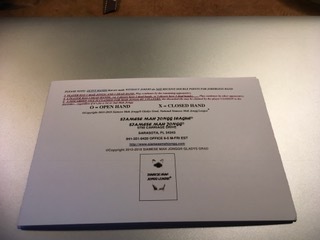 This entry was posted in Mah Jongg and Me and tagged mah jongg, Mah Jongg iPhone case, mahjong, popup phone stand, where the winds blow on June 3, 2018 by Mah Jongg and Me.